What are the latest enhancements? IBM Mobile Foundation V8.0 helps improve developer experience, streamline operations and app updates, provide flexibility with more hybrid cloud deployment options and complement your mobile strategy with multichannel API creation and management. It helps reduce the time required to build apps. What are the updates to developer capabilities? 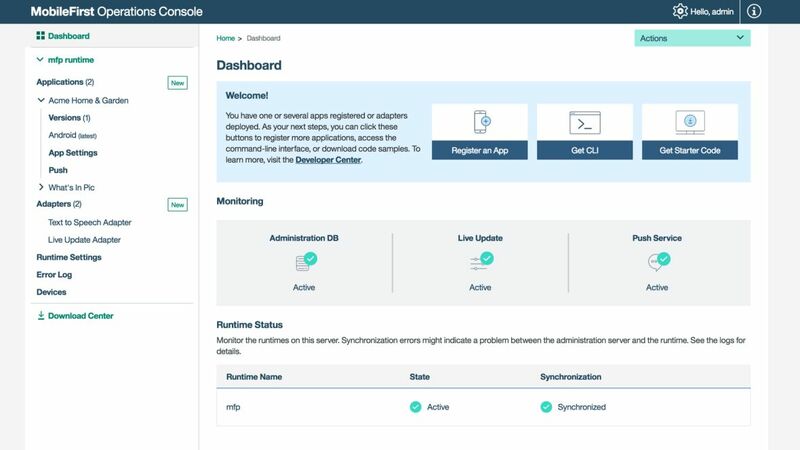 IBM Mobile Foundation V8.0 can help you streamline the process for incremental app updates and cut release cycle times from weeks to days with enhanced automation and new developer and IT self-service capabilities. What are the latest hybrid cloud deployment options? IBM Mobile Foundation V8.0 helps optimize speed, scalability and costs while adding flexibility to your mobile infrastructure with more hybrid cloud deployment options. You can port your workload seamlessly between hybrid cloud environments, including on-premises and private clouds.